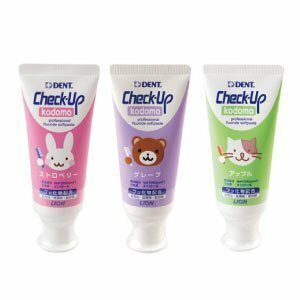 Lion Check-up Kodomo Toothpaste 60g, 3 Tubes (Strawberry, Grape, Apple) by Lion at Get Cheap Health Insurance. MPN: 23905. Hurry! Limited time offer. Offer valid only while supplies last. 【how to use】 1. Squeeze toothpaste onto toothbrush. 2. Brush the whole mouth thoroughly. 3. Spit out. Rinse your mouth once only.